The management of Lagoon Hospitals has appointed two renowned international Nigerian surgeons as part of measures to further upgrade services and provide more specialist areas of care. The surgeons are Dr Jimi Coker, Head of Department, Endoscopy Services at the Doncaster and Bassetlaw NHS Trust, UK and Dr Segun Abudu, Consultant Orthopedic Surgeon at the Royal Orthopedic Hospital Birmingham also in the United Kingdom (UK). They are both seconded to Lagoon Hospitals for a year as part of a technical exchange agreement following on from the Surgery for the Future launch held last September. Dr Jimi Coker is a consultant general surgeon with specialist interests in Colorectal and Laparoscopic surgery and Dr Segun Abudu specializes in Major Joint Reconstructive Surgery and Orthopedic Oncology. They will both lead a team of surgeons in General Surgery and Orthopedics respectively. Dr Coker will be working with the largest team in Nigeria to pioneer Laparoscopic surgery and also perform diagnostic endoscopy on various conditions such as stomach pains, haemorrhoids (piles), lower and upper stomach pains and specific conditions like cancer. Group Managing Director, Lagoon Hospitals, Mrs. Fola Laoye stated that they would also perform keyhole surgery to repair hernias and treatment of gallstones. Dr Coker also specializes in the modern treatment of haemorrhoids. 'Dr Abudu will alongside an in-house team of orthopaedic surgeons, lead the team in carrying out orthopaedic surgeries hence taking orthopaedic tertiary care to another level at Lagoon Hospital. This team of surgeons will be the largest team of orthopaedics within any private hospital in Lagos to date. They will also perform various types of surgeries including knee and hip replacements, keyhole surgery for the knee (arthroscopy), correction of bone deformities, treat bone infections, provide high level care for patients with bone cancers and soft tissue lumps as well as perform, bone replacements with modern options in patients with bone loss from any cause including fractures etc. They will also provide care for patients with neck and back pains, and muscular problems. 'Having Dr Jimi Coker and Dr Segun Abudu on board at Lagoon Hospitals for these long periods of time will not only assist in ensuring that the level of General Surgery and Orthopedic care in Lagoon Hospitals is at a much higher level than before, this will in turn ensure Lagoon Hospitals achieve an increase in the number of high end surgeries. It is an honor to have them with us. 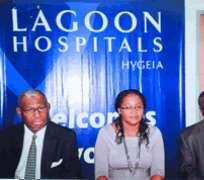 'Lagoon Hospitals is one of the largest healthcare companies in Nigeria under the Hygeia Group providing a range of both primary and tertiary healthcare services across the three sites: Lagoon Apapa, Lagoon Ikeja and Lagoon Victoria Island respectively,' she said.